Blackpool lost a seven-goal thriller in east Lancashire on Thursday night, conceding a winner in the 89th minute after the teams had shared six goals in the first half. Martin Baird took the captain's armband and the Mechanics started the stronger, playing some attractive football. It was no surprise when Conah Bishop opened the scoring in the ninth minute. However, the lead lasted just three minutes. A defensive error gave the chance to Michael Gervin, who slotted the ball past Alex Cameron to make it 1-1. AFC were soon back in the lead, Bishop adding his second in the 18th minute. The home side turned the game on its head in three minutes. First another defensive error saw Anthony Hall pounce for the second equaliser on 32 minutes. And soon afterwards Adrian Bellamy added a third to give the home side the lead for the first time. That goal appeared to knock the confidence of the AFC players, but just as it looked as though Bacup would go into the break leading, AFC's top scorer Ben Duffield managed to get his head on the ball to make it 3-3 at half-time. The second half was dominated for the most part by Bacup, though AFC also had chances. 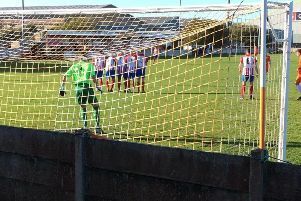 Cameron did well to prevent the home side from taking the lead again, but just as the game appeared to be heading for a draw, Bacup were awarded a free-kick on the edge of the box in the 89th minute. Up stepped Bellamy to slot the ball home for his second of the game and give all three points to the home side. It was heartache for AFC, while the Bacup players celebrated wildly. 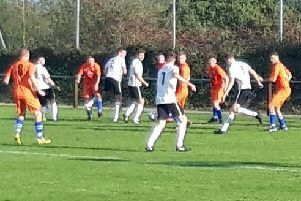 Blackpool remain 10th in Hallmark Security League first division north, still two points above Bacup, but they would have leapt to fifth had they won. Saturday is Non-League Day and AFC are at home to second-bottom Holker Old Boys. Blackpool: Cameron, Donaghy, Betteridge, Caunce, Mottram, Hall, Finlayson, Baird, Duffield, Bradley, Bishop; subs: Thomason, Sinclair, Taylor, Courlay, Bishop. AFC Blackpool this week celebrated the debut of the club's former player Kurt Willoughby for the England C team. Striker Willoughby, now with FC United of Manchester, came off the bench in the national non-league team's 1-0 win over Estonia Under-23s at Leyton Orient on Wednesday. Blackpool-born Willoughby is best remembered by AFC supporters for his 30-yard winner against Bootle in March 2015. That match was watched by a record crowd of more than 500 at the Mechanics Ground. AFC Fylde's Ryan Croasdale captained England C to victory in London.